What do sheep have to do with the extinction of a butterfly? Why do some beetles pretend to be ants? How do orchid flowers make male wasps feel frisky and why do bees have smelly feet? Research is increasingly uncovering the answers to these and other equally intriguing questions. The existence of staggeringly complex and often bizarre relationships between any number of different species makes this a fascinating field of study. A good place to start looking for weird and wonderful relationships is in the largely unseen world of ants. Many thousands of species of these enormously successful, co-operative, social insects have been described from around the world. A single tree in Perus Amazon Basin was found to harbour no less than 72 different species of ant. Different ant species have adapted to live in just about every conceivable terrestrial habitat. The worlds only known ant swimmers have also recently been discovered inside pitcher plants in Borneo (therein lies another article in itself). Because ants are co-operative insects, they can be enormously successful at finding food - often collectively dragging back food items many times their size. (Perhaps equivalent to you and I trying to drag back an elephant for tea.) The social nature of their society means that the other members of the ant colony will also get to share in any booty as well. Any animal managing to successfully persuade an ant colony that it is an honorary ant can therefore expect to gain many fringe benefits. However, this can be a perilous business. Ants can be extremely ferocious, both in finding food and in defending their nests, so woe betide any individual whose cover is blown. Around 300 different species of animals (mostly insects) live inside ants nests in Britain. Not all of them are welcome guests. Some eke out a secretive existence, grabbing whatever they can. Some are either tolerated or ignored, while relatively few are treated as honoured guests. These honoured few actually accomplish the remarkable feat of persuading the ants to accept them as part of the colony by chemically manipulating the behaviour of the ants. Many animals produce pheromones. These are chemicals which help an individual to communicate with other members of the species. Thus ants may produce chemicals which will appease other ants, or tell them to disperse or attack. There is convincing evidence that each ant species has a specific set of pheromones. It seems that the ant guests actually survive by being able to mimic the pheromones of their hosts, producing the appropriate response from their host by producing the right chemical at the right time. The caterpillars of many butterflies belonging to the family Lycaenidae are associated with ants in one way or another. The Large Blue Butterfly (Maculinea arion) is one of our afore-mentioned species which is accepted as a guest in the nests of ants. The Large Blue Butterfly was unfortunately declared extinct in Britain in the late 1970s. It was never widespread and had always been scarce due to the complexity of its lifecycle. The butterfly lays its eggs on wild thyme plants. The caterpillars initially feed on the flowers of the thyme, but later wander around, soliciting the attentions of a particular red ant species. The caterpillars produce secretions from a honey gland which the ants will consume. They then signal to the ant by hunching up their thorax , whereupon they are carried down into the ants nest. The (un? )grateful caterpillars then spend the winter feeding on ant larvae and being fed by ant workers. They hibernate in the coldest weather and pupate in early summer inside the ant nest. The emerging adult butterfly then has to climb out into the outside world to complete the lifecycle. It is thought to produce appeasement pheromones as it goes to prevent the ants from attacking it at this highly vulnerable stage. A major factor in the extinction of the Large Blue was the removal of sheep from its habitats. This seems incomprehensible until it is revealed that the host ant species requires a warm habitat with very short turf. This is where the sheep come into the picture. In the absence of grazing, the grass quickly becomes too tall and the right ant (and eventually the wild thyme) disappears. The cost of reintroduction has also been estimated at £100,000. Contrary to popular opinion, conservation does not come cheaply! However, I can report that big business does occasionally come to the rescue of some of our endangered species and that ICI have supported the reintroduction of the Large Blue. Besides lycaenid larvae such as the Large Blue, there are also many beetle species which frequent ant nests. Seventy of the 300 known ant guests in England are beetles. One of these beetles has two different ant hosts depending on the time of year. It spends its summer with a particular type of woodland ant, laying its eggs alongside those of its host and then migrates to grassland ants nests for its winter quarters. It does this because unlike the woodland ants, the grassland ants will feed the beetles alongside their own larvae all winter. The beetles can locate the ant nests by smell and they will then wait to be carried into the nest by the ants. They inhibit aggression in the ants via a chemical secretion. (One wonders if it would be possible to patent it!) They also have glands in the sides of their abdomens which cause the ants to pick them up and carry them inside. In addition, they have a gland producing a repellent substance should all else fail. If it is indeed true that each ant species has its own specific set of pheromones, then this tale is particularly remarkable. One really wonders at the series of evolutionary steps that might have led to such a complex arrangement, with the beetles producing entirely different sets of chemicals depending on whether they are approaching a winter or a summer host. Clearly there is a subtle exciting world of smell out there, which we with our poor olfactory organs are totally unaware of. While we are on the subject of smell, I recently came across an article delightfully breaking the news that bees too, have smelly feet. Apparently, recent research indicates that bees leave behind a chemical odour on flowers which they have recently visited. This prevents their chums from wasting their energy on flowers which have already been denuded of nectar. Not all flowers pollinated by bees or wasps entice them there with nectar. Some have far more cunning ploys. 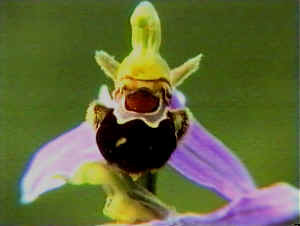 Thus several orchid species have flowers which visually mimic the female of a particular wasp or bee species. The male wasps (or bees) are fooled into attempting to mate with the flower, pollinating the orchid in the process. Amazingly, the attraction is not only visual, but may also involve the production of the right female wasp or bee pheromones by the orchid flower. Could it be possible that our own native bee and wasp orchids are travelling along the same evolutionary route? I could continue indefinitely. Descriptions of similar astonishing species interactions would fill several books. Indeed, Charles Darwin wrote a whole book just on the pollinating mechanisms of orchids. At this point, however, I must leave my tales of animal antics as time and space are limiting. The sheer complexity of the relationships described, not to mention those undescribed or unknown, leads to the inescapable conclusion that we havent even scratched the surface of understanding how individual habitats work. This being the case, our priority should always be to preserve habitats with all their unseen complexities, rather than trying to preserve individual species in isolation.